But for some reason, Rick Adelman stuck with some guys who weren’t responsible for getting them their big lead in the first place, and rather than replace them to mix things up, he not only kept the same guys in the game, the main substitution he made was to put offensive ‘powerhouse’ Chuck Hayes into the game. Right. And he hardly gave speed-demon Aaron Brooks — who could have given the Warriors a taste of their own medicine — any playing time (4 minutes). Like I’ve said several times before this season, Adelman’s moves (or lack of making a move) are confounding. That’s why I find it ironic when certain people (you know who you are) say that many fans have been unfairly impatient with Adelman, and even go to the point where they basically say, “I told you so” when the Rockets evened their record at 15-15. And they say a 750+ win coach should not be questioned as much as he has been this season because he has a track record for success. That’s ridiculous. Everyone can see how slow he has been to make moves that have hurt the team. A record like the Rockets have (now 15-16) is nothing to take pride in, given the talent on this team and the experience he has. A player and a coach can only be judged on how well they have been performing lately. Like someone said recently, “You’re only as good as your record is.” And it’s not like Adelman is so great that he hasn’t been fired before in his life. Also, look at what teams like Portland (13 game winning streak) and Atlanta are now doing with much younger and unrefined talent with coaches who won much less games than Adelman. Finally, look at Jeff Van Gundy. Just because he had won so many games as a coach doesn’t mean he’s got the goods to win a championship. One of JVG’s downfalls was not only a very predictable offense that couldn’t score points, but he didn’t cultivate his younger players that required a bricklayer like Rafer Alston to average over 40 minutes a game, and it came back to burn the Rockets in last season’s playoffs. These factors, as well as others, contributed heavily to his firing. I’m not saying Adelman should be fired yet, but don’t immunize him from criticism, either. With that said, I’m not going to blame this loss against the Warriors completely on Adelman. The Rockets missed their last 9 three-point attempts while Golden State made most of theirs. I just think you can’t play “business as usual” to beat the Warriors when you’re a mediocre team like the Rockets, despite calls from some people that you’ve just got to ‘play your game.’ I thought Adelman was being creative by playing Novak in the first half, but then the game completely changed and for some reason, Novak wasn’t utilized as much as he was in the second quarter. 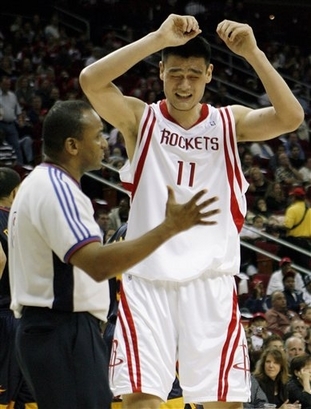 There’s a lot of other things I could analyze about this game, like Yao’s foul troubles and 8 field goal attempts, Rafer Alston’s surprising performance, the 23 Rocket turnovers, etc. But this is one of those rare times where I just can’t get motivated to analyze this game as much as usual. Maybe it’s because I’m so disappointed the Rockets didn’t “turn the corner” heading into the New Year with a major upset, or because it’s New Year’s Eve and the early start-time of the game threw me off. Or maybe because the guys over at the Houston Chronicle have done a good job describing what happened in the game about as good as I could describe. I don’t know. I just want to start fresh in the New Year, just like the Rockets should, and put a terrible 2007 season behind me as soon as possible. This entry was posted on Tuesday, January 1st, 2008 at 1:49 am	and is filed under vs. Golden State. You can follow any responses to this entry through the RSS 2.0 feed. There may be a safety clause in Disaster Idleman’s contract, stipulating that, under ANY circumstances, he will not and cannot be fired within the contract period. That explains why he is still in place despite making numerous ridiculous decisions. I’m sure a lot of fans are sick and tired of the B.S. calls against Yao. Baron Davis ran into a standing Yao with the ball and that’s an offensive foul on Yao?! Biedrins was grabbing and pulling on Yao and Yao got called for offensive foul?!? This is just B.S.! More and more NBA refs are gambling and rigging the games. COME ON! I thought FBI is doing an investigation on this mess?? This is just sickening and DISGUSTING! I read that Tracy is no longer happy at Houston? Is this true? I read it on ESPN insider but there wasn’t a direct quote from Tmac himself…Can someone confirm this? He makes about 1/4 million per game and he’s not happy? The poor baby is feeling that nobody in Houston loves him. I hope there comes a day, unlikely though, when athletes are paid only when they play. I bet TMac’s kneees would get better in a hurry! !